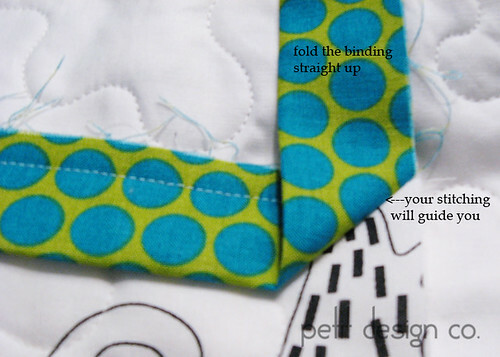 This tutorial is for Double Fold Straight Grain Binding. now take that total and divide by 42” (width of fabric- WOF) to figure out how many strips of fabric you will need to cut out. To figure out how many inches of fabric you will need to buy take the number of strips you need x the width of your cut binding. remember to add a little so that you can square up the fabric before cutting out the binding strips. 2) Cut out your binding strips along the WOF. We are going to join them with a mitered (diagonal) seam. I love this method because it gives the appearance of a bias binding and also reduces bulk at the seams. To do this place 2 strips of fabric as shown in the illustration. Don’t forget to trim your selvedge edges first. 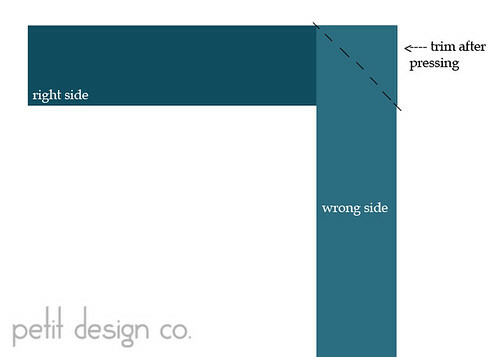 Make sure that right sides are facing each other. Using a quilting ruler and a pencil mark that 45° sewing line. 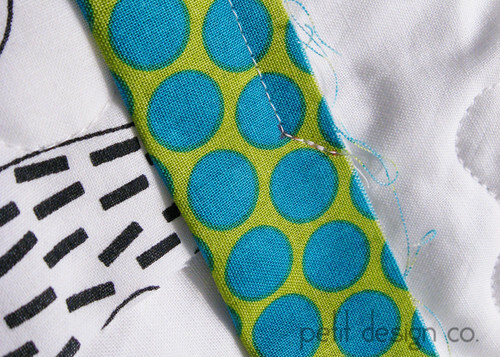 Pin the 2 fabrics together and sew on your marked line. You can back stitch if you like but I usually just shorten my stitch length a little bit. 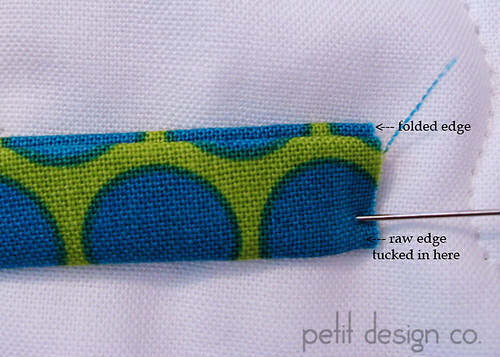 Press the seam to one side (pick a side any side) and trim the little triangle leaving a 1/4” seam allowance. Repeat for each of the strips. If you choose to mark and pin all of your strips at once be careful when using solid fabric for your binding because it is very easy to confuse the “right” and “wrong” sides. 3) Once you have all your strips sewn into one long strip, you are going to fold it in half lengthwise with wrong sides facing and iron it flat. It should end up looking like the very first picture in this post. 4) The next step is to figure out where you will sew the binding to the quilt. 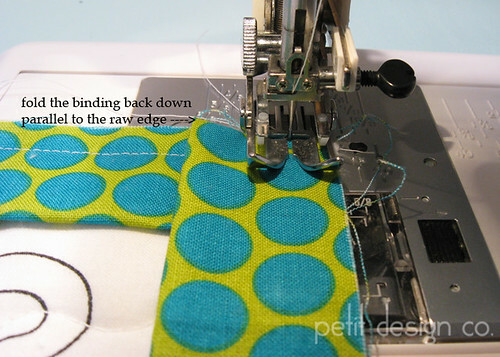 Take your binding and fold it into thirds so that the raw edges end up encased in the binding. Finger press (hard) so that you will be able to see your fold lines when you open up the binding. You only need to do this for about 1-2” at the end of your binding. 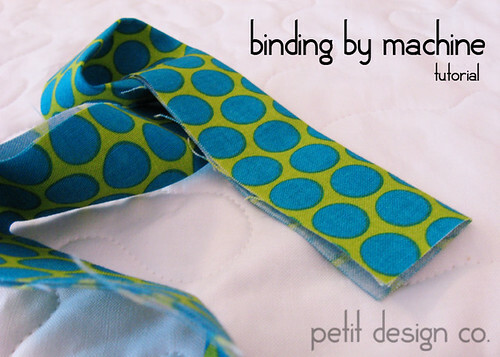 5) No open up your binding and take it over to your machine. If you want, you can mark the fold line closest to the raw edges with a pen. It’s going to end up on the inside so you won't see it when you are done. 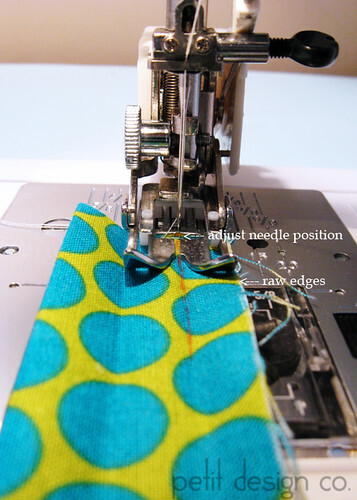 Adjust your needle position so that your binding is aligned with the edge of your foot and the needle is right on the fold line. 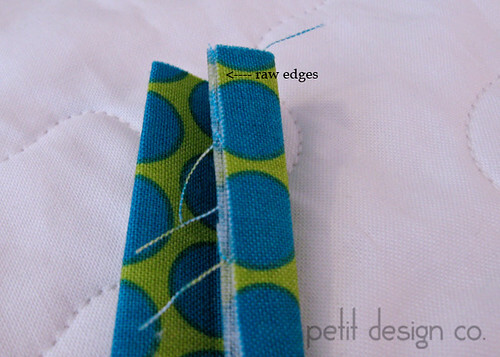 6) Pin your binding to the back of your quilt aligning the raw edge of the quilt with the raw edges of your binding. You only need to pin enough to get you started. If you pin the binding to the whole quilt you will find that you need to re-adjust often because the binding has a tendency to stretch out as you are sewing. I also like to start pinning so that my binding travels in a clock wise direction around the quilt so that the bulk of the quilt is on the table rather than in the throat of the sewing machine. 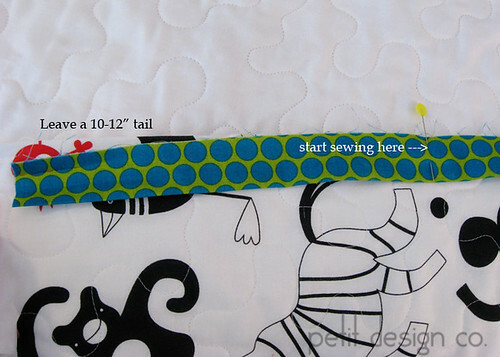 Make sure you leave a 10-12” tail of binding unsewn at the beginning. You will also want to make sure you don’t start right next to a corner. I like to start at least 8-10” away from the bottom right corner. Don’t forget to backstitch at your starting point. 7) Continue sewing until you are nearing a corner. You will want to know the distance between your raw edges and your fold line for this step. When you reach the corner you will stop 3/8” away from the edge of the quilt (or whatever distance you came up with in step 5 if you are using binding other than 2.5” wide.) 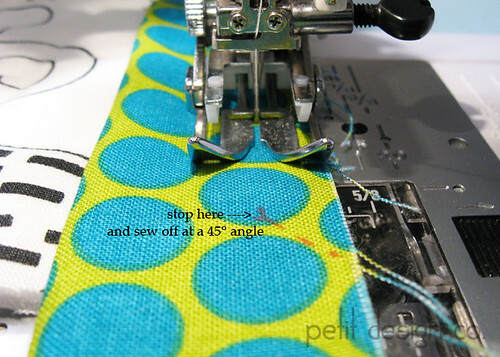 Then sew towards the corner of your quilt at a 45° angle. Backstitch right before the edge of the quilt. then straight down making sure to align the new fold in your binding with the raw edges of the quilt. 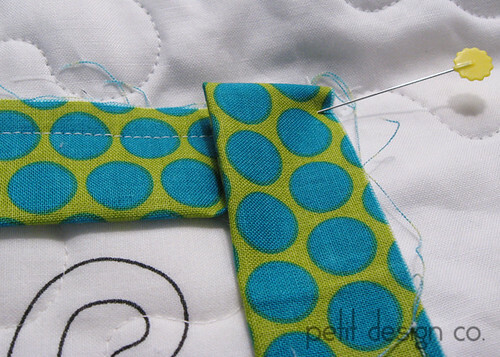 9) Resume stitching right at the edge of the quilt, backstitching to keep things in place. 10) Continue in this manner until you round your last corner. When you are back to the side that you started at stop and back stitch 10-12” from where you started. Do not trim off any extra binding at this point! That 12” gap In the binding will help you finish it off nicely. The bigger the gap the easier it will be to maneuver the binding in the next few steps. Come back tomorrow for the exciting conclusion in Part Two! That's exactly how I bind mine too but I always make mine 2.75 inches. It took me a few quilts to get good at zig zag sewing the front but now I'm practically an expert! This is great. I love this series. I use my walking foot for binding too. BUT I use bias binding and I cut mine 2.25 inches wide. I love the tip to fold in thirds to get the exact seam allowance. I'll have to try that next time.